At the age of 14, Ashley Funk ’16 became determined to decrease America’s addiction to fossil fuels. Funk has worked towards this goal ever since, and was recently awarded a Greater Research Opportunities (GRO) fellowship from the U.S. Environmental Protection Agency in support of her efforts. Funk joins a line of Wellesley women who have won one of these prestigious fellowships in recent years, including Tiana Ramos '13, Ellen Bechtel '14, and Kate Corcoran '15. The GRO fellowship program forms part of the agency’s efforts to improve science, technology, engineering, and mathematics education, and encourage leadership in the nation’s environmental science, research restoration, pollution prevention, and sustainability efforts. Awarded to 40 American students annually, it provides approximately $50,000 toward undergraduate study and an EPA fellowship to students interested in environmental careers. Growing up, Funk cherished her hometown community, nestled in the Appalachian Mountains, but was pained to see the lasting ill effects of the town’s coal mining heritage on human health and the environment. Once prolific, mining has not taken place in the area for nearly a century; yet still, the forests had been sullied with mounds of coal waste. They were impossible for Funk to ignore even after all this time due to the proximity of one such dump to her back yard. 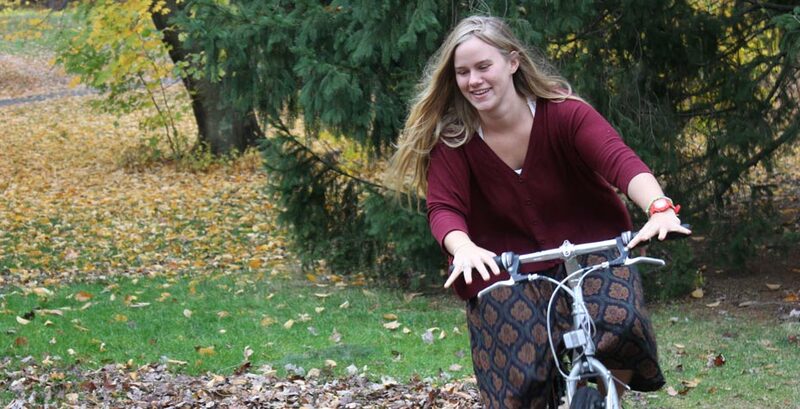 When she was 17, she filed a petition for rulemaking with the Pennsylvania Department of Environmental Quality with hopes of reducing carbon emissions. She is involved in a student group striving to make environmental studies pedagogy more inclusive to racial and ideological difference. Funk explains, “My experiences growing up in my hometown motivated me to start working for environmental and social causes, hoping that a societal shift away from fossil fuels would spare other communities from going down a similar path as my own.” The group's efforts include planning the lecture series Going Beyond Green: Race, Difference, and the Environment. Funk also serves on the Sustainability Advisory Committee, a group of administrative, faculty, staff, and student representatives advising the president on strategies to implement greener policies at Wellesley. Funk is a passionate resident and member of the Sustainability Cooperative (SCoop), which she calls her most valued community on campus. N.B. Ashley always wears a bicycle helmet, except for grassy photo shoots, and suggests all bike riders do too.